I’ve created a UX Case Study (PDF 400kb) to show the progressive user interface changes I have made to the American Airlines check-in kiosk. Below are some items from the UX intranet site I created. Of course they are heavily-edited to hide sensitive info (due to confidential agreements). For additional info on the usability work I’ve done, please check out my blog articles. The Use Case Flower is the illustration I created to end many discussions where others tried to tell me that all the use cases work in order sequentially just like railroad tracks. Not only did I squash that idea forever, the flower is now the starting point for introducing newcomers to the process flow for this particular software application. 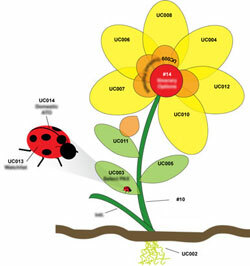 The ITPMO for this department loves the flower as a teaching tool! The main tech lead requested that I hot link the use cases directly to the illustration. 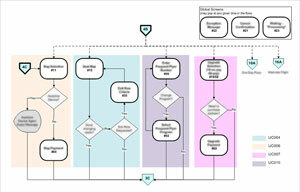 Here is the dry Visio version of the high-level process flow. There are over 100 wireframes and 16 pages of flow for this application. Each color block represents a different use case whereas the flower petals in the above illustration served the same purpose. The rounded squares represent different wireframes. All the items in the flow were hotlinked to the use case flows and wireframes they represented. I tried to create as much drill down and interactivity as one UX designer can maintain while juggling multiple projects.